This pet may be used by non-engineers. The recipe is an uncommon BoU world drop found on random [6-20] mobs. First pet, first to level 25. great starter pet as the speed boost does low damage and helps you get a trap off before the other pet attacks. This was the pet that got me started. I almost chose the Mana Wyrmling, because I love its appearance. I soon learned that a battle pet's appearance doesn't really matter; it's the abilities and stats that really count. Anyway, I've always used Metal Fist/Extra Plating/Wind-Up on this pet at 25. My first pet, the one that got me started. Known as Species 4401 as this is the designated ID of the planet "Mechanical Squirrel Box" which this nut eater originally claimed home to. Located in the Delta Quadrant, this species was valued by the Borg for their maneuverability and are now used for infiltration missions. Don`t let his cute looks fool you, the little fellow packs a MEAN punch with the wind-up ability. Boyfriend is an engineer and when he told me he had a surprise I was over joyed to see this little guy in my trade window! When underwater he makes a foam behind himself as he travels caused by him beating his tail. 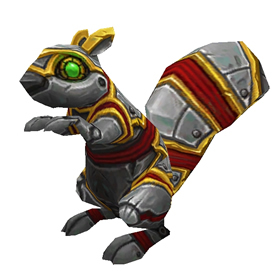 Notice how you need 2 Malachite (green gems) to make this squirrel, and that the squirrel has two green eyes. /s We can rebuild Squirrel. We have the technology. We can make him better, stronger, faster.